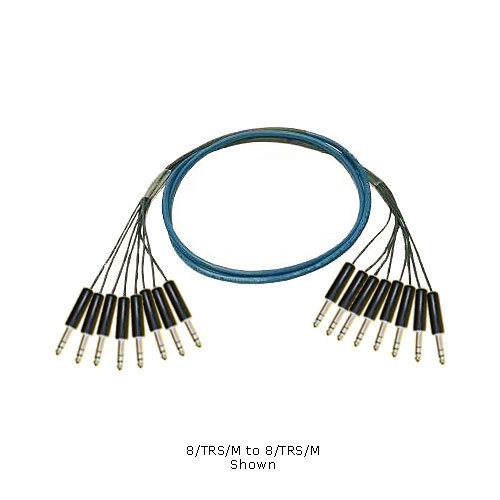 This Whirlwind Medusa Multitrack Series 32 Channel 1/4" TRS Male to 1/4" TRS Male Fanout Snake Cable is constructed of multipair cable with a heat-shrunk fanout at each end. The cabling consists of heavy duty, flexible Belden CM rated multipair cable. Each pair contains two twisted 24GA 7x32 polyethylene insulated conductors with 100% foil shield and 24GA drain wire. The fanouts feature genuine Whirlwind 1/4" TRS connectors, and all channels are numbered.